It’s always gumbo season in my mind. 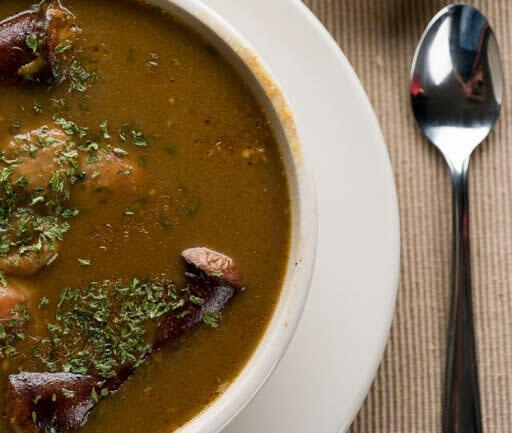 And while grandma’s recipe will always be #1, there are several local restaurants that are serving gumbo variety. Which is perfect, I can eat gumbo for every meal and never get bored with the flavors! 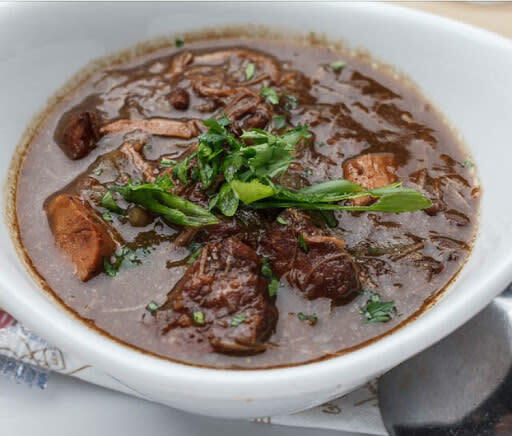 It’s no surprise in “Sportsmans Paradise” that chefs at 1910 have brought together 2 of the most popular hunting seasons (deer and duck) into one delicious bowl of gumbo. The richness of the duck meat is complemented by the savory and smoky flavors of the andouille. Topped with cut green onions. Delicious. Both of these gumbos are started with a rich, dark roux. 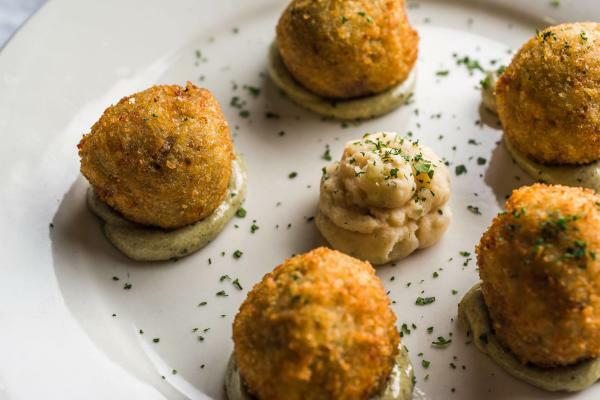 You’ll love the richness and nuttiness of the roux, and sweetness from the Louisiana shrimp. And the cut okra gives this recipe a unique texture and flavor. 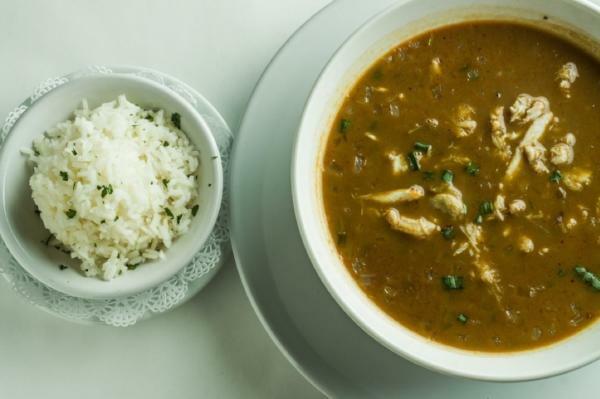 Blue Dog’s recipe for seafood gumbo is one to beat. Packed with shrimp, oysters and Louisiana blue crab; it’s a testament to the fresh seafood that can be found along the Gulf Coast. You know Mama Reta makes her gumbo the old-fashion way – 100% from scratch. Nothing proves this more than the gumbo served with the chicken still on the bone. Full of flavor and “how momma made it” charm. In this recipe, traditional filé powder (ground sassafras leaves), is used as a thickening agent rather than other traditional methods of using okra or roux. Creole gumbo recipes usually call for the addition of filé powder after the gumbo is cooked and the heat has just been turned off. 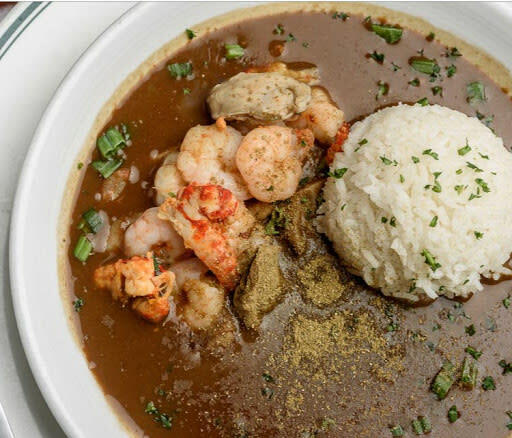 At Landry’s you can order filé gumbo with shrimp, crawfish, or seafood. What is your favorite gumbo? Let us know in the comments.